Aqueduct Vibrato Welcome to your new EarthQuaker Devices Aqueduct Vibrato! Contrary to whatâs written on the faceplate of certain famous deluxe amplifiers, Vibrato is a form of frequency (or wavelength) modulation which we hear as a variation in pitch. It is often confused with Tremolo, which among other things, is a type of amplitude modulation our ears hear as a change in volume. 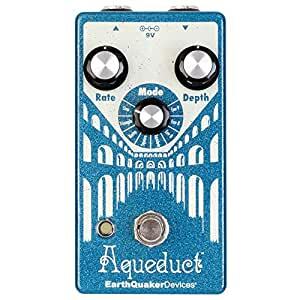 Aqueduct uses a short delay line with eight different modulation modes to deliver gentle rolling pitch-wobbles, steady kosmiche pulsations, rapid trills, slimy sonic squiggles, whammy bar wiggles, and anything else your pitch-warped brain can picture in your murky mindâs eye. The controls are simple. Rate (1) adjusts the LFO speed which controls how quickly the pitchrises and falls. Depth (2) controls the LFO amplitude, adjusting the intensity of the vibrato effect. The rotary switch labeled Mode (3) selects between one of eight LFO waveshape and envelope combinations which drastically alter the character of the modulation and make Aqueduct adaptable to nearly any musical situation.